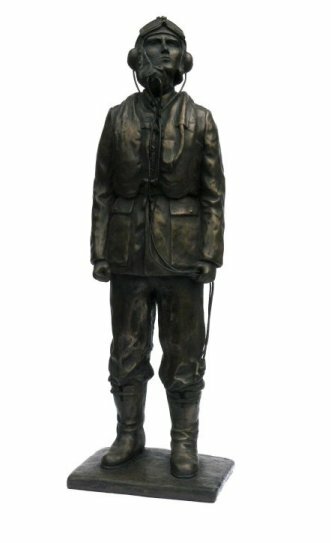 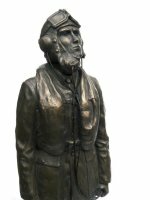 In this sculpture Peter Close has sought to personify one of Dowding's young RAF fighter pilots of the Battle of Britain. 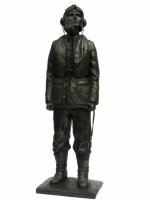 In a crumpled uniform he stands looking to the sky with the air of youthful defiance that earned these young men Churchill's accolade of 'The Few'. 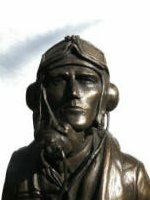 The Pilot is depicted wearing a service dress uniform with shirt and tie, 1936 pattern boots, 1932 pattern 'Mae West', 'B' type flying helmet with 'D' oxygen mask and Mk III goggles. 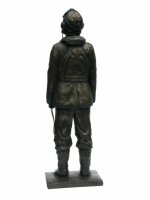 This cold cast Bronze Battle of Britain Pilot sculpture is made entirely by hand by sculptor Peter Close in his studio in Somerset.